I apologize for my recent absence from these pages! I have been working on polishing my forthcoming book, Pulling Taffy, a project that has included recording the audio version of the book. I’m still working on setting things up for the book so I’m afraid I won’t be posting a lot in the near future. But I CAN offer you this food-related story, which I wrote recently for the Greenfield Recorder. 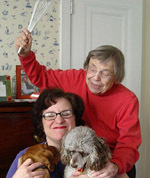 “Follow your passion” is Poppy Pendle’s motto. Poppy’s creator lives by that motto as well. 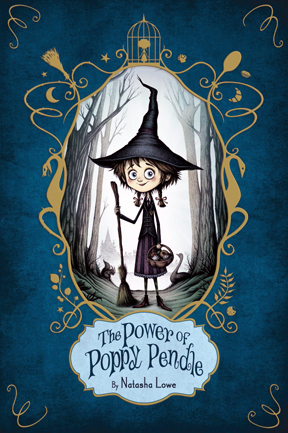 A book for young readers (more or less eight to 12 year olds), The Power of Poppy Pendle is only a few months old but has already entered its second printing. 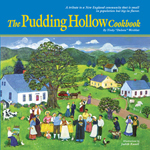 Poppy’s author is the English-born Natasha Lowe, who lives in an 1840 house in Deerfield, Massachusetts, with an entrepreneurial husband, four children, a busy kitchen, and a vibrant imagination. Natasha’s passion for storytelling—and for life—comes across with gusto in her huge smile and her rapid conversational style. She told me in a recent interview that she inherited her love of narrative from her parents. Poppy Pendle is one such witch. The book opens with her birth in a bakery, a location that foreshadows Poppy’s passion. The child Poppy wants nothing more than to be a baker. Unfortunately, her parents detect that she has magical powers and want her to grow up to be a prestigious white witch like her Great-Granny Mabel. They enroll Poppy in an academy of magic. She excels at charms and spells but would trade them all for a plate of cookies. She flies with grace but would rather wield a rolling pin than a broomstick. Her parents ignore her protestations that she doesn’t want to be a witch, breaking Poppy’s heart by taking the oven out of their kitchen so that she won’t be distracted from her magical studies by baking projects. Eventually, Poppy’s frustration and anger, combined with her talent for magic, lead her to go over to “the dark side.” She casts spells that put her at odds with her family, her teachers, and society at large. She must re-find her passion before she can right the wrongs she has done and move forward in life. The lesson also came from her parents, who always had faith in her, she recalled. She came to this country in her late teens on a student visa, looking for a place to learn creative writing. Fate changed her plans when she met the man she was to marry, and he quickly proposed. “It was one of those crazy, impulsive things,” she recalled. Natasha’s husband had purchased the house on the main street of Historic Deerfield as an investment while he was a senior at Deerfield Academy. The pair fixed the house up as a bed and breakfast and hired someone to run it. When that person was unable to honor the commitment at the last minute, Natasha found herself drafted as the temporary proprietor of the Tea House Bed and Breakfast. After a year in Deerfield she was hooked. “Going through all the seasons [here], I realized I didn’t want to be anywhere else,” she told me. The bed and breakfast lasted for about five years, and then, in Natasha’s words, “the guestrooms started filling up with children, and it was hard to offer romantic getaways with toddlers running around underfoot!” The house was a family home rather than a B&B from then on. Natasha had always been interested in writing and had had a few short stories published in her youth. A few years ago, when her youngest child, Juliette, started kindergarten, Natasha decided that she didn’t want to look back at her life years later with regret. Despite this luck, it took a few years and a few rewrites before The Power of Poppy Pendle made its way to Simon & Schuster, where esteemed children’s book editor Paula Wiseman fell in love with the book. Wiseman’s main request was one that fit perfectly with Natasha Lowe’s vision of the book. She asked whether the author would consider adding some of Poppy’s recipes as an appendix. Natasha launched herself into recipe testing (she admitted that she tried so many batches of lemon bars that today one of her sons refuses to eat them), and the final book now offers ten tempting recipes, including the cupcake recipe below. I asked Natasha about the origins of Poppy’s story. She explained that it all began with a stone goose her husband brought home one day from an auction and placed in the garden. “It does look really, really real,” said Natasha. 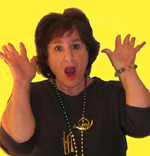 Her then four-year-old daughter Juliette wanted an explanation for the goose’s surprised expression. “I said maybe a witch had put a spell on it,” her mother explained. Of course, Juliette wanted to know about the witch … and on the spot Natasha came up with the story of a young witch who was upset because she wanted to be a baker, not a witch. Today Natasha is enjoying the task of publicizing her book—talking to children, adults, and even seniors about Poppy Pendle. She is also working on several new writing projects. “I’m never short of ideas!” she told me with a smile. Poppy Pendle dreamed up these delicious treats after drinking her first cup of French brewed coffee at her favorite bakery. Natasha told me that in England a “coffee cake” is a cake flavored with coffee rather than something to accompany a hot beverage. Put the milk into a little dish (a small china ramekin is ideal) and warm it in the microwave for about ten seconds. If you don’t have a microwave, just warm some milk gently in a saucepan and measure out 1 tablespoon into a little dish. Sprinkle the espresso powder over the milk, and stir to blend. If there is a food processor in your home, ask an adult to help you set it up and whiz all the cake ingredients together, including the espresso-flavored milk. Then go to the pouring and baking step. Otherwise, put your stick of softened butter into a large bowl, and, using a hand-held mixer, whiz the butter around until it is nice and fluffy. Pour the sugar on top and beat together with the butter until well blended. Go slowly at first because you don’t want sugar flying all over the counter. Add the eggs, one at a time, beating well after each addition. You can ask an adult to help you with this if you like because you don’t want bits of eggshell in the batter. Add the vanilla extract, then the self-rising flour (or flour and baking powder) and the salt and mix quickly again. You don’t want to over mix the ingredients or your cakes will be tough. Now, mix the powerful espresso flavored milk into your cake batter, scraping around the little dish to make sure you get it all in. The batter will turn a rich coffee color and smell delicious. Arrange 12 paper cup-cake wrappers inside a muffin tin or, if you want to make miniature cup cakes, you will need about 36 mini paper wrappers for a mini muffin pan. Fill each cup halfway with cake batter, and bake for 16 to 20 minutes for regular cup cakes, 9 to 14 minutes for minis. You might want to ask an adult to help you get the cakes into and out of the oven. Let cool them on a wire rack. Makes 12 regular sized cup cakes or about 36 mini cup cakes. You can make this while the cup cakes are baking. Pour the milk into a tiny dish. Warm the milk in the microwave for about 10 seconds and sprinkle the espresso powder on top. Stir to blend. Put the softened butter into a large bowl and shake the confectioner’s sugar on top. Using a big wooden spoon or a hand-held mixer (Natasha likes to use a hand-held mixer because it makes the frosting really smooth and creamy), gently stir the espresso flavored milk into the mixture, and blend together until soft and creamy. Go slowly to begin with; otherwise you will have sugar all over your counter! If you want a softer frosting, just add a drop or two more milk. 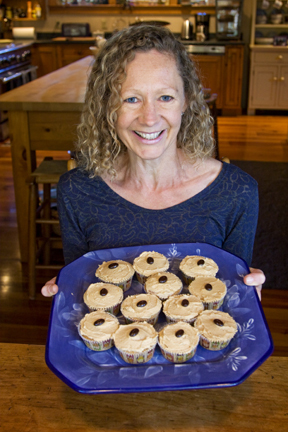 Using a dinner knife, smooth the frosting on top of the cup cakes and decorate with a coffee-flavored chocolate bean. 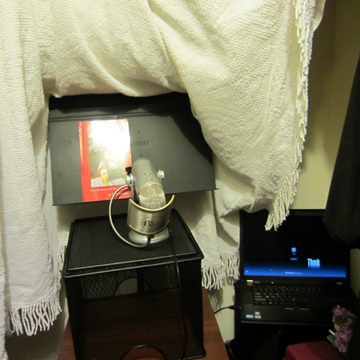 Just for fun, here’s a look at my homemade recording studio…..